Adventuring is a dangerous business. Characters sometimes don't make it back after an adventure. If it's a truly rough time, none of them may come back. That's what's generally known as a "Total Party Kill" (or TPK for short). Well, with the newest edition of D&D, there are new ways for DMs to achieve that TPK. 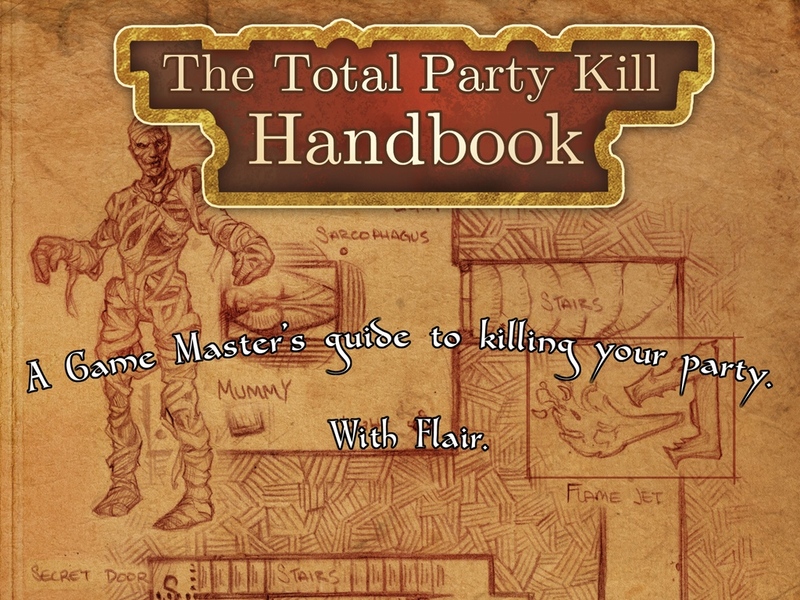 The Total Party Kill Handbook, up on Kickstarter now, is all-but-guaranteed to have your players rolling up new characters. Within the handbook you'll find twenty-five encounters, each of which is ready to run. They all have full maps to guide you, monsters with which to sic on your players, and puzzles to confound them in every way. If the players do happen to make it through, there's treasure to be had. The encounters range from level 1 to level 20 and there's also a guide to help you scale up or down the encounter to make sure it fits correctly with where your party is currently. There's also a Trap Workshop with wonderfully heinous mechanisms to befuddle even the best rogues. The campaign is a little more than 50% funded with still 23 days to go.